The skin is the horse’s largest organ and is made up of two layers: the epidermis and the dermis. It is important to remember that your horse’s skin is his first barrier to help regulate body temperature, maintain skin hydration and potential health concerns. The epidermis is the fairly thin, outermost layer of the skin and is comprised of layers of tough cells that protect the underlying tissues. As cells move up in this layer, they become less “cell-like” and more of a fibrous barrier. The main component here is keratin, which contributes to making the epidermis water-resistant. This is why water will run off your horse so that he doesn’t get truly waterlogged, and internal water won’t evaporate from the cells underneath. Melanin, another protein found in the epidermis, acts to provide pigment for both skin and hair. Vitamin D is also manufactured in the epidermis and is essential to calcium metabolism and healthy bones. The epidermis acts as a mechanical barrier to invading pathogens. In addition, equine skin normally has an acidic pH, which makes it less attractive for colonization. Parasites also look for breaks in the skin in which to lay eggs or invade the delicate tissues underneath. Epidermal cells are continuously shed and replaced. The normal cycle time is 17 days, but can be influenced by factors like weather, time of year and diet. A horse with a slower epidermal turnover time might have flaky skin, just like dandruff in a person. Many of the important skin glands, such as oil or sebaceous glands and sweat glands, pass up through the epidermis and open on the skin surface. Hair follicles also travel up through the epidermis. These skin structures are based in the dermis —the next layer of the skin. The dermis is a thicker layer of skin right under the epidermis. This layer is full of blood vessels, nerves and the main portion of the sweat and sebaceous glands. Hair follicles are based here, and fat cells add padding. The nerve endings in the dermis signal temperature changes, discomfort and pressure. They are sensitive enough to feel a fly landing, so consider that when using your aids while riding! These sensory nerves relay information to the horse’s brain. Motor nerves stimulate action of some sort. They may get the loose connective and muscle layer to twitch to remove the fly or cause the sweat glands to excrete sweat. 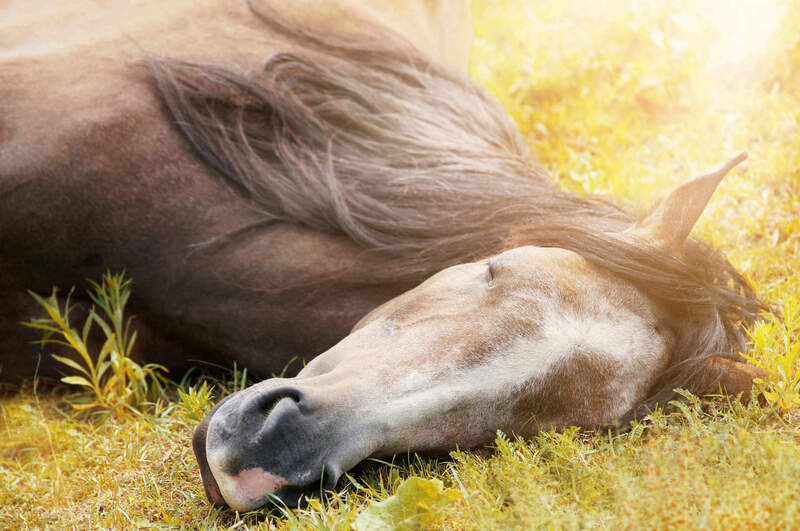 Horses are considered the “champion sweat producers” of all our domestic animals, and have two types of sweat glands: apocrine and eccrine glands. The primary sweat glands are the apocrine glands. These are responsible for sweat production when your horse is outside on a hot day or has engaged in a hard workout. Apocrine glands are located all over your horse’s body; whereas, eccrine glands are located solely in the frog of the foot. Horses use sweating to help cool off. Instead of panting like a dog, the sweating works to cool your horse off through evaporation. Once the sweat appears on your horse’s external skin, it evaporates and removes some of the heat buildup from internal tissues. To be effective, the air must be cooler than your horse and ideally of low humidity. With repeated days of heavy sweating, your horse can lose electrolytes, as well as water. You may need to replace these via his diet with supplements, such as Electro Dex electrolyte powder. The sebaceous glands in the skin produce oils that help to keep the skin pliable. They also prevent hair from becoming dry and brittle, and limit evaporation. Horses with an excess of sebum (the oil mix produced by these glands) may have a greasy feel to their hair coats. Because the skin is a first line of protection against invaders, many immune-related cells are found in the skin. When these cells are functioning correctly, they act to inhibit germ growth and even repel some parasites. If your horse develops hives from an insect bite, the mast cells in his skin most likely responded to cause the swelling. Skin allergies, such as the reaction to the Culicoides gnats, are from immune cells in the skin. Unfortunately, immune cells can also become overactive. They may cause reactions totally beyond what a threat deserves, such as horses that develop hypersensitivities to insect bites. In rare cases, a horse’s immune cells may attack his own cells, causing autoimmune concerns. By housing the hair follicles and melanocytes, your horse’s skin also determines his color. There are three primary horse color pigments: black, brown and yellow. These pigments can be mixed and matched to create all the equine coat colors. Your horse has three types of hair: permanent hair like his mane and tail, which grows and does not shed out; tactile hairs like whiskers; and the regular hair coat, which grows and sheds out with the stimulation of light. A healthy skin and coat serves as an indicator for a horse’s inner health, so his beauty is more than just skin deep! Happy Riding! Electro Dex is a trademark of Farnam Companies, Inc.